Fresh Luo Han Guo - have you seen/tried it before? I was just doing some grocery shopping on Tuesday night at Mid Valley's Aeon Big when I came across this whole shelf of interesting looking fruits/vegetables. 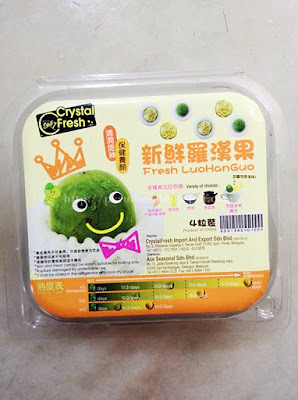 As I looked closer at the stacks of boxes on the shelves, I realized that they're actually fresh Luo Han Guo that I've never seen in my life (really.....I've only seen the dried ones). This fruit is more commonly found at Chinese medicine shops in their dried form (round, brown fruit) & costs around RM1.50/fruit these days. My mum boils it like a herbal tea to repel body heat & she will also boil it when we are having cough. Apparently, the fresh Luo Han Guo is good for heat stroke/thirst, acute and chronic throat inflammation, aphonia, chronic cough, constipation and as a sugar substitute for diabetics! 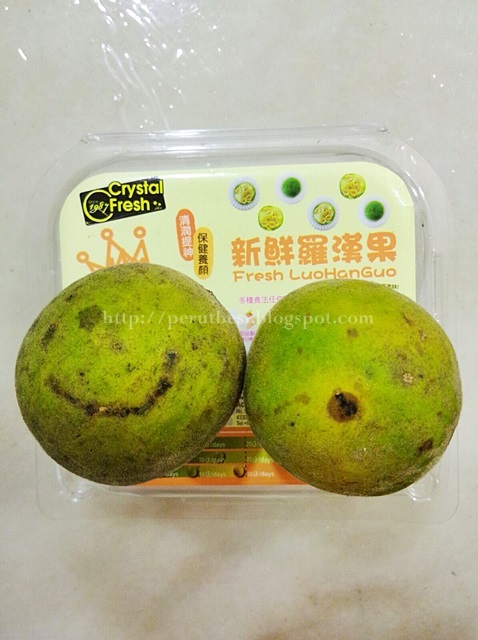 I read on the small information sheet that came with the box of fresh Luo Han Guo that these fresh fruits have are higher in vitamin C, fiber & flavanoids compared to the dried fruit since the drying process requires the fruit to be treated at up to 80ºC fo 48 hours. The process may preserve the fruit for longer periods, but will also lead to depletion in nutrients. The skin & flesh of the fruit cannot be eaten as it is (it looks like mangosteen! ), so you'll have to wash the fruit clean, crush it & put it into a pot to be boiled with 4-5 cups of water for 10 minutes. The small leaflet suggests to add 2 slices of ginger as well. The drink is REALLY sweet & actually has the licorice bark ("kam chou") taste, so the drink reminded me of those birds' nest with ginseng. Yes, birds' nest with ginseng! You can boil the fruit twice, so my mum actually placed 2 fruits into the pot & we had 2 pots of fresh Luo Han Guo drinks...YUMS! All for just RM2.90/box of 4 fruits from Aeon Big Mid Valley...I think it's a promo price, but it's SO worth the try! My initial idea of the movie was one of war in the Roman empire days like those 3000 BC movie, but when I saw the trailer, I was quite intrigued to find out more from the premier how the movie actually goes. Together with 3 friends, we set out for a girls-night-out to catch the premier of Hail, Caesar! all thanks to Food Panda. Four-time Oscar (R)-winning filmmakers Joel and Ethan Coen (No Country for Old Men, True Grit, Fargo) write and direct Hail, Caesar!, an all-star comedy set during the latter years of Hollywood's Golden Age. Starring Josh Brolin, George Clooney, Alden Ehrenreich, Ralph Fiennes, Jonah Hill, Scarlett Johansson, Frances McDormand, Tilda Swinton and Channing Tatum, Hail, Caesar! follows a single day in the life of a studio fixer who is presented with plenty of problems to fix. My 'funny-bone' was also tickled when the studio got Hobie Doyle (played by Alden Ehrenreich), a typical B-western cowboy, to play the lead role of a romantic, rich man. It was clear that a character like Hobie couldn't fit the romeo character, but that's how the movie infused elements of humour (rather queer ones, I've to say) into itself. What's Food Panda? It's an online food delivery service that connects hungry people to great food. With a few simple clicks from your phone/computer, your food will be delivered to the comfort of your own home/office piping hot. You can find more information from their website: www.foodpanda.my. A&W: Hello? Is this Ms Ruth Wong? A&W: I'm Shahid calling from A&W Malaysia. We would like to invite you to a special dinner for 2 on Sunday..
A&W: Oh, it's a special dinner that we would like to invite you & your partner to come..it's gonna be a course meal like in hotels...it's for winners of a contest & we want to also invite a blogger to come...you can choose from selected outlets to enjoy the meal. Ruth: Er...okaaay....I'll get back to you with confirmation once I confirm with my partner, ok? I found it totally peculiar. Valentine's Day celebration at A&W?? As you could see, we did agree to attend this 'special complimentary dinner for 2' after all. We were pleasantly surprised to find the tables set up specially for such occasion although not in the most 'romantic' of fashions. When we entered the restaurant, we were greeted personally by the waiter, waitress & restaurant manager at the Kota Damansara branch; I thought that was quite nice until I found out that they were informed of my name & it was also stated at the table reserved for me. Hohoho. The special menu for the night was more nostalgic than romantic. Thankfully AP isn't very particular with his food & was more than glad to have fast food (especially A&W since the Kuantan's branch was closed down) for dinner despite it being V-Day. To him, it's just any other Sunday...haha. Our entree was an 11" long chicken coney dog with coney & cheesy sauce. TOTALLY NOSTALGIC! The taste was still as delicious as how I last remembered it & we thought this could be A&W's all-time favorite/signature dish if it's marketed differently. We enjoyed the coney dog (esp with cheese! ), but the almost foot long coney dog would look better if the hotdog bun is 1 long bun instead of 2 usual size hotdog buns with 1 long sausage. We ended our meal with the A&Wsome waffle + 1 scoop of vanilla ice-cream topped with strawberry sauce, AP's favorite flavor! I think AP enjoyed this meal more than I did cos all his favorites were served one after another...hahaha. Thank you, A&W Malaysia & the Kota Damansara branch's team for the lovely treat! We will certainly look out for the upgraded 11" cheesy coney dog to be included into the menu later this year *fingers crossed* Oh, the one thing that could certainly make this dinner more 'romantic' is the selection of songs played in the restaurant; they could have just put on some V-Day related songs/love songs instead of having the usual Malay radio channel. Chinese New Year Eve 2016 - Ushering the Year of Abundance! With the house Internet giving problems at this rather 'crucial' time of updating, I'm thankful that there's still phone data to update this blog ^.^ Time really flies; we're already in the 2nd month of this new year! With Chinese New Year Eve today, many Chinese families have traveled a distance just to get back to their hometown in time for the reunion dinner, an important event set aside, to meet up with family members for a hearty meal before a new year begins. It has been a tradition for my family to gather with my dad's side of the family for festival dinners, as long as I could remember. Typically, our Chinese New Year Eve dinner (and most family gatherings) is hosted at our "family home". Each nucleus family will bring a dish to 'complete' the menu that will consist of approximately 8-10 different meat/vegetable dishes, ALL home-cooked! :) My family is really blessed to have such talented & skillful home-breed-chefs! We started tonight's dinner with the tossing of the "Yee Sang", a vegetables + pickles + crackers + fish slices/jelly fish/abalone slices (all of such 'meats' are optional) dish, harmoniously blending with crushed peanuts, toasted sesame seeds, & our home-favorite additional ingredient of the kaffir lime leaves shreds, & drizzled with sweet maltose, some 'cooked oil', white pepper, & five spice powder. This year's Chinese New Year Eve dinner was an overflowing, abundance of dishes, which we could carry forward to our new lunar year! Lol! Traditionally, Chinese families have believed in having more than enough food for the year ahead to symbolize an even abundant new year! Seems like my family could have some good "choy kiok" dish (a type of dish made from left-overs, but tastes 'oh-so-delish'!) on the 2nd day of the new lunar year :D Woohoo! It ain't just any monkey business! 9 dishes plus a charcoal-boiled soup! PerutBesi wishes all families & friends celebrating this joyous festival of reunions a VERY HAPPY CHINESE NEW YEAR; GONG HEI FATT CHOY with greater successes, better health & abundance of blessings!